January 23rd, 2010 • Controversies, The Industry, WTF World? And here I thought I was done with controversies for the week. For those who haven’t heard, there’s been a big to-do in the past few days over another instance of cover art whitewashing re a YA novel called Magic Under Glass by debut author Jaclyn Dolamore. Like the last instance, it turned into a big thing, with some big-name editors and authors in the field weighing in on the issue. And a whole lot of readers got pissed off — again — as they should, IMO, because the problem of whitewashing has gone on for literally decades in the book industry (and other media, as I mentioned when I blogged about this before). At its core, whitewashing is rooted in racism — the belief that people of color aren’t interesting enough, attractive enough, “universal” enough, or empathetic enough to appeal to the white audience that is assumed to be buying most books. Ergo, their presence within the book must be hidden on the cover. And racism, as I already mentioned, doesn’t go away on its own; loud, intensive, angry agitation is what breaks the inertia. In this case it’s already been successful; Bloomsbury made the decision to stop production on the whitewashed version of Magic Under Glass and rework the cover art with a more representative model. Yay! That such a boycott would hurt the authors whose work has been whitewashed (and others) is understood. In fact I’ve seen more than one commenter in some of these conversations essentially suggesting that those authors deserve to get boycotted if they sell their books to publishers who whitewash. Authors shouldn’t support such publishers, the reasoning goes, because the publishers won’t respect the author’s vision of the characters. Authors should instead support some of the newer PoC-focused small presses that have popped up, like Tu Publishing and Verb Noire. I think supporting TP and VN are great ideas; both authors and readers should do this. This is a great way to find some new voices, and I hope both presses grow and thrive. And I think the protesters are right in that small/specialized presses offer authors some real advantages. But boycotting authors — yeah, authors like me — who don’t choose to go this route? Whiskey Tango Foxtrot. OK, look, here’s how it works. Publishing is a business venture — a partnership. An author who thinks their writing is something people will want to read seeks an investor who can make this happen. The author gets some things out of this deal: publicity, financial support for their future writing in the form of an advance, and someone to handle all the stuff us artsy-fartsy types don’t usually like to think about, like A4 acid-free versus B5 partial pulp paper and endcap displays and discounting and good grief I’m a writer not a supply chain engineer so why would I possibly care. Anyway, the publisher also gets some things in exchange for the money they’re investing — usually they control anything having to do with marketing, distribution, and sales. “Marketing” includes the cover art. Now, I’ve heard lots of people in this debate suggesting that going with a small/specialized press is a way for an author to retain control over their cover art. That’s just not true. Small presses necessarily (because they’re small) make less of an investment in the author’s work. Most small presses don’t have the budget for large advances, big print runs, much in the way of marketing, distribution to chain stores, and so on. So they’re usually less pushy about exerting their rights. But they can, and many of them do, because ultimately their investment is on the line. A good publisher will try to make the author happy, they really don’t have to. So small press or big, the author has no control over the cover art. The only way for an author to control the cover art is to forego this business partnership entirely — to self-publish. And that brings in a whole other set of problems. When I was, hmm, 12 years old? Somewhere thereabouts. I found this book, with this cover, at my local library. Probably wouldn’t have picked it up if I hadn’t been bored mindless — not because the cover characters were white, but because the art just isn’t very interesting. I didn’t realize the protagonist was black until 20 pages in. Didn’t realize the author was black until years later, though I suspected it after reading the book. (Gay people have “gaydar”; black people have “blackdar”. Trufax!) But reading this book, and the author’s subsequent books, rocked my world. I realized, thanks to Ms. Butler, that I could write science fiction and fantasy if I wanted. That we have a place in the future too, and our past is more than slavery and Civil Rights. I will say this point-blank: if I had not discovered Octavia Butler then, I would probably not be publishing a novel now. Might not even be writing. Obviously I would have found her more easily if the cover art had been representative. I can’t help wondering how many other kids like me missed the chance to see something of themselves in SFF back then, because they had no idea SFF was about anything but white people. I was lucky to find this book. But the reason the book was there in the library for me to find was because it had come from a big publisher. My hometown library was too small to carry small-press or self-published works on its shelves. So if Octavia had self-published, or gone to the PoC-friendly small presses of the time — there were some; the idea isn’t new — I might never have found her. Not even if the cover art had looked like it does now. The book just wouldn’t have been anywhere I could have accessed it. 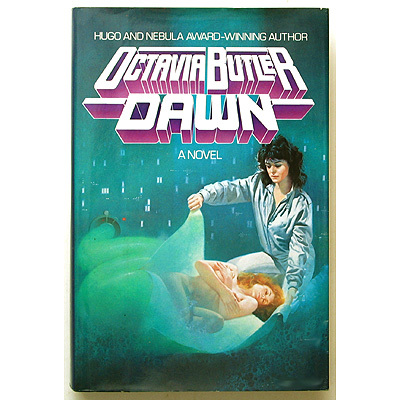 Now, imagine someone had decided to start a boycott of Butler’s publisher back then, because of that Dawn cover. If Butler suffered because of that — oh well, too bad, she should’ve sold her book to a PoC-friendly press, right? Butler’s publisher would very likely have blamed the boycott and any poor sales on Butler — on the “risk” they’d taken in publishing a black author’s work, or the “risk” of a black protagonist, or the “risk” of publishing a story that dealt frankly with issues of race and gender and power. Not only would Butler have had real trouble selling another book to that publisher or anyone else, but very likely every other similarly “risky” author would have instantly become persona non grata in the industry. It’s illogical, and there’s a racist whiff to the notion that PoC are risky, but it’s a plain fact: when publishers take risks and fail, they don’t take those risks again, or at least not soon. Thus Octavia Butler’s career might have ended or been interrupted with that novel, and the generation of writers of color whom she inspired might be much, much smaller now. Jaclyn Dolamore — who might very well be part of the generation inspired by Butler too; Butler was loved by more than just geeky black girls — has made good choices here. She chose to include characters of color in her fantasy novel, and from what I understand she did a good job of it. She chose to publish that novel with a large, powerful company which could get her book in front of lots of readers… even if it meant she had to give up some control to make this happen. Bloomsbury made a bad choice — a stupid one, in the wake of the Liar affair — but that doesn’t mean Dolamore was wrong to sign with them. Racism in this industry takes many forms, and cover art whitewashing is only one of them. What’s inside the book is more of a problem, IMO: it’s very, very hard to find characters of color who are written intelligently and put front and center as the protagonist. What we have in Magic Under Glass is just such a character, and what we have in Jaclyn Dolamore is a rare author who is willing to give us such a character. I am all for angry protest, but this is a case of taking a Magnum .357 to your nose to spite your face. Is a boycott really worth losing this intriguing character in future novels, and/or the author who created her? Making it harder for other authors to break in, if they want to write characters like this? Making it harder for readers to find such characters, because there will be fewer of them? A boycott would do all of these things, IMO. It wouldn’t be right. But it would happen. So I’ll write a letter to Bloomsbury; I might sign the petition; I’ll blog about it; and when I meet industry people at conventions and so forth, I’ll talk with them about it. When I next see whitewashed cover art — because I highly doubt this will be the last incident; the habit is too ingrained in the industry to be cleared up that quickly — I’ll sit down with everyone I know and explain why I think the art is a problem, and why that problem occurs. I’ll keep trying to make good choices for my own career. All of these things are helpful. But a boycott? No way. I called for the boycott. And I did not make the decision lightly, but nowhere did I argue the author was to blame. I launched a boycott against the publisher and not the author, and while the author would have suffered if we had been successful, I think it matters to be clear we oppose the publisher. While there were those who did disagreed with boycotting, it got mentioned enough and I think that contributed to bringing attention and support to the book. Many of the author’s readers came out in droves at the idea that her book would be boycotted. If you haven’t seen my Open Letter please read it. I’m very clear what my intent is. And I respect your right and reasons for not supporting a boycott. We each must consciously decide how we will voice our protest. My friends and peers did not all agree on how, but we respected each other’s right to choose. And among my circle we did not lose focus. We did not hurl insults at the author and we didn’t dilute the debate about inaccuracies. The debate is about race and representation. The boycott page will come down after supporters have had time to find our new link, Readers Against WhiteWashing and we’ve migrated relevant links to our new page. I never argued that boycotting was the only option. It was the right option for me at the time and I asked others who believed the same to join me. I will continue to protest whitewashing. I simply won’t be leading a boycott to do it. N, I have no money at stake. I am not an aspiring writer but I am one of your most committed supporters. I founded Color Online because I am passionate about your voice being heard. We are small but we are dedicated to supporting and promoting writers of color. We do so because we want to read your stories. I hope that commitment is never doubted. I’m glad to hear from you on this; I wasn’t quite sure how “out” you wanted to be about the boycott (I hadn’t seen that readers against whitewashing link you provided; thanks). Also wasn’t sure who had originated it, and didn’t want to make a mistake. Like I said in the post, I agree with your principles and I very much believe your anger is in the right place and justified. The only problem is the boycott itself. A boycott is not a precision instrument; it’s a shotgun. There’s no way to target just the publisher. You end up shooting every author who has partnered with that company, and every aspiring author who’s hoping to get published with that company (it’s not like there are a lot of publishers left these days), and every agent who’s committed to representing PoC authors and their works, and so on. And while you may be right in that Dolamore has gotten much more publicity as a result of this, to her benefit, I don’t think that’ll be the case for every Bloomsbury author. There might be other B-authors writing good PoC characters who haven’t been noticed yet, maybe because they’re still in the pipeline or their characters are part of an ensemble cast or maybe they’ve got covers like mine that don’t display the protag at all, or whatever. A boycott will hit them too. And I can’t help wondering what kind of chilling effect this will have on authors who want to write PoC protagonists. You’ve been very clear in that you don’t want to penalize the authors for what their publishers have done — but not everyone who’s angry right now feels the same way. I’ve seen more than one person express anger at the authors — and I suppose that’s the part that really bothers me. Because I know how hard it is to try and write a protagonist of color, in an industry that is not known for welcoming them. While I was writing 100K I worried constantly that I might not find a publisher for it at all, much less one who would or wouldn’t whitewash. And now I’ve got to worry about readers getting mad at me if some future publisher of mine decides to whitewash my stuff? Again, I know you weren’t saying this, and most of the people involved in the debate weren’t. But some were. That’s also the shotgun effect of a boycott; you can’t control everyone’s participation, or their reasons for it. You might only be targeting the publisher, but anytime you get a group of people together, some are going to bring different agendas to the table — like those who believe that authors of color should only self-publish or be published by PoC-friendly presses. (I’ve run into that attitude for years, completely apart from this debate, and some of the frustration I’m expressing in this post is targeted at those people.) Or whatever. If there were some way to boycott just a publisher, without hitting its authors or others who are trying to do the right thing, I would be all for it. But that isn’t possible. So I will be sticking to other forms of protest. Thanks for responding. I didn’t know you didn’t know the boycott originated with me. If I say it, I own it so if you ever hear something from me feel free to name me. Open dialogue and disagreement is healthy and to be expected. I believe that any real change is going to come at a price and how we will pay that price isn’t something we have complete control over. I will continue to protest by raising awareness about POC writers and books, publicly criticizing publishers when I know of specific whitewashing incidents and promoting and supporting writers of color. I stated from the onset I am in this for the long haul. Whatever methods I use, I will do so having given them real consideration and always with respect for all those involved. You weren’t the only one calling for a boycott, is the thing; that’s why I wasn’t sure where it was coming from. Also why I responded to this with a blog post (though where I saw people saying things specifically, like that Livejournal I linked, I spoke to them). And yeah, it’s clear you’ve thought about it, and I’m glad you respect my disagreement. I think we’re both fighting the same fight, just in different ways. We are fighting the same fight and I am so glad not to be alone. I agree with the points you make in this post N. A boycott harms the author who actually wrote about a POC and will probably turn other publishing companies away from publishing books about poc. I applaud the author for writing about a POC and I’m even more pleased that the cover will be changed to reflect the main character. I wish authors had a say in their covers. How hard is it to just email your author and ask them for a description of the mc or any cover ideas they have? *sigh*. I think the best way to go is (as you state) email, blog and sign the petition. Also I want to see more bloggers reviewing books about POC, that will really help. I’m currently working on seeing which publishing house has the most diverse book options, it hsould be interesting. I’ve been following this issue ever since it got posted to “Dear Author”. Personally, I find the amount of anger disproportionate to the crime. I happen to be lily-white, but I’ve lived overseas for long enough to have some understanding of what it’s like to be a minority. I agree that there are times when voices must be raised in aner. As far as the book covers, though, I’m just not sure it’s an intentional slight. I’ve seen any number of unicorns on science fiction books and all manner of heroes and heroines bearing no resemblance to the characters in the book. Cover art is usually picked/commissioned by marketing folks who are more interested in getting it correctly shelved by retailers, and noticed by buyers than insuring an accurate portrayal of the protagonist. However, maybe I’m wrong, and the whole thing is an intentional campaign to disenfranchise POC, perpetuated by the evil and oppressive publishing industry. If that’s the case, I STILL think that the boycott, an angry letters, and (sometimes ludicrous) demands are unlikely to achieve the desired result. Bloomsbury has already replaced one cover, and will probably replace the other (which looks more Mediterranean than white to me), losing a substantial amount of money in the process. The current outrage has given them a dandy of a black eye. However, those editors will now be turning that freshly-blackened eye toward manuscripts submitted by POC, and doubtless asking if publishing them is worth the risk. Editors make many decisions based on the quality of the manuscript, but they ALSO consider how difficult the author (and the author’s audience) is to work with. I’m afraid that any further concessions are likely to be Pyrrhic — a few covers and a public apology followed by years of reluctance to consider work featuring, or written by, people of color. At any rate, I wish you well however this plays out. This was an intelligent and well-constructed article, and if your books show the same attention to detail, your future looks bright indeed. There’s a good reason publishers don’t always listen to the author, as I’ve come to understand: authors are writers, not visual artists, and not marketers. We have no idea what matters re: typefaces and composition and how to draw the eye to this or that element. Frankly, go troll through the self-published books on Amazon sometime. See what happens when authors have total control over their own covers. It’s not pretty. First, living overseas really isn’t the same thing as spending your whole life as a person of color in a predominantly-white country. The experience can help you understand what it’s like to be a minority, yes, to a degree. But growing up in a country that bombards you with ugly messages about yourself and everyone like you — being raised by parents who’ve been bombarded with such messages themselves, and internalized them — having your own history and all positive depictions of yourself hidden so as to reinforce the message that you’re nothing, you’re worthless, you’re a waste of space… no. Being a white foreigner in another country (especially if that country has ever been colonized by Europeans) is in no way the same. Second — of course whitewashing isn’t done by cackling moustache-twirling villains scheming in seedy corporate boardrooms to Keep The Brown People Down. But note what I said about how the experience of people of color in the US (since we’re talking about US books here) is one of constant bombardment with horrifying racist messages. Whitewashing adds to those messages by saying: brown people are ugly. They’re so repellent that they can’t sell books. Our readers are so racist that they’ll never buy a book with a brown person on it, so let’s trick them into buying it. I mean, really. This kind of thinking doesn’t even make sense; if brown people are so bad, why publish books with brown protagonists at all? Whitewashed covers insult the intelligence of the entire reading public, PoC and white alike. And there’s no excuse for it. By this point we’ve seen that books with PoC covers will sell. Octavia Butler’s books would not still be in print if only black people were buying her stuff — and for the past 20 years her covers have been plastered with racially-accurate depictions of her characters. (Who are black, Asian, Latino, and multiracial.) There are other examples of books with brown faces selling well to the whole reading public — so there’s no logical reason for whitewashing to still be taking place. Then again, racism has nothing to do with logic. Which is why you’re right on one level; these anti-whitewashing protests might cause a backlash… for a short while. But I don’t think it will last, because I don’t think publishers are stupid. They’re in this to make money, and they understand there’s a great deal of money to be made from appealing to the whole reading public, not just white readers. That reading public — particularly in YA — is already very diverse, and becoming more so as the country’s demographics change. To sell to that audience, the publishers are simply going to have to change, and shed their old racist habits. If the worst they get is a PR black eye or two in the process, they’re lucky. It could be much worse — nobody’s talking lawsuits or filing discrimination charges, which has happened in other American industries that kept up racist practices long past the point of logic. So again, my quibble is with one specific method of protest that’s been proposed. But all the rest of it? The angry blogging and the letter writing and so forth? I think that’s precisely what’s needed. Well, perhaps we’ll have to agree to disagree. I’ve been beaten badly (as in hospital stays were involved), more than once, based on simply the color of my skin. Called names, run out of the area, forced to flee for my life. But obviously I have no idea what racism is. I find it incredibly arrogant that so many POC assume they’re so special, their suffering so unique that white people can’t possibly even imagine it. But enough of that — there’s more than enough hurt and anger on both sides, and far too much guilt to spread around. In all honesty, I wish the very best for both the authors, and the publisher involved. Changing a couple of covers is likely a fairly expensive lesson for them, and hopefully the publisher will pick covers that better represent the books in the future. However, basically threatening a lawsuit based on “racist” practices (as evidenced by a couple of covers) is like swatting flies with a hand grenade. If such a tactic were attempted, my prediction is that it would backfire badly. I’m posting anonymously for a reason, but I’ve been involved with publishing for many years. I’ve helped write and market several NYT bestselling novels(including a few featuring non-white protagonists). I also know the industry. With all of the recent mergers, I can count the editors at the major NY houses on my fingers with a couple left over. They talk with one another, and all of them are VERY risk adverse. A couple of lawsuits and a little too much bad press, and (in my opinion) they’re more likely to simply pass over any future books featuring POC than they are to capitulate and grovel for approval. However, that’s just my opinion. As you’ve reminded me, I can’t possibly understand POC, so there’s no point seeking common ground. Apparently, it’s not my fight, so I’m signing off. Once again, my best regards to Jaclyn Dolamore, N.K. Jemison, and even Bloomsbury, who seems to be trying to do the right thing. Wow, way to put words in my mouth, Lurker. I’m not going to spend any more energy on this, either, because you’re not actually listening to me, as evidenced by the fact that you’ve just responded to a bunch of stuff I didn’t actually say. It’s a shame, too, because if you are in the industry then you’ve got a unique perspective and I think you might be able to contribute something new to the conversation… but it is a conversation, after all. And if all you’re going to do is refute points that haven’t been made, then you’re really just talking to yourself. Which is fine, but why do that on a stranger’s blog? Well put. You responded far more politely than I would have. Yeesh. It barely took five commenters to find a racist troll this time! That must be a new record. Oh, wait. I’m a white male in the rural UK, so I’m reluctant to comment on racism. I know a little, I know I should know more. I’ve been victim of assault for my Irish background but I don’t really know about the day to day effects of things like whitewashing and all the other stuff. What I want to say is that from my perspective I just don’t get why publishers would think I would be less likely to buy a book by a woman or by a PoC or if it has a PoC on the cover etc. That assumption they make about me, and I’m not special in this respect, that my critical faculties are so feeble that I can’t get beyond such superficial matters as the author’s name or colour to investigate the actual text is quite insulting to me.